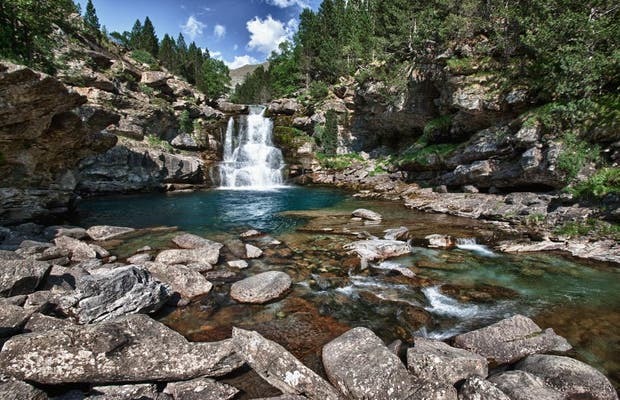 We continue walking through the Ordesa Valley to visit the waterfall of steps of SOAS; Arazas River falls down on rocks that have been carved over thousands of years to accommodate these giant steps that spit water in deep pools of a deeper blue. To get here we continue up through the beech forest, under the magic of the few rays passing through the thickness of these beautiful specimens (some ancient) until the road slowly emerged from the darkness, along the river, and the valley suddenly opens up before our eyes, a Pine Valley of grasslands and black. Continue up the valley, the Cascade of steps of SOAS, the road becomes narrower, but still OK; climb 1480m to Strait Cascades and the Cave, 1778m in the steps of SOAS.